The forecast was for 20 mph winds all week but lessened to just 15 to 17 the day before. So our fleet of paddlers snapped a quick photo at Calhoun’s Riverside RV Retreat boat ramp in from of the paddling trail kiosk and put-in for the official opening of the Texas Parks and Wildlife Seadrift Paddling Trail. The lower Guadalupe River is as beautiful as the upper reaches, lined with Cypress, Black Willow and Oak, sprinkled with saucer-sized bright pink morning glories and 4 ft tall spider lilies. A few smallish, sheepish alligators basked on the bank and darted under the water as we approach. A roof, metal debris and three sides of a cattle shoot littered the bank, likely remnants of Hurricane Harvey. The last 5.5 miles across Guadalupe Bay and around the bend into San Antonio Bay greeted us with it’s usual head wind but decided to be a little stiffer than yesterday’s forecast. Late and tired we made it to the boat ramp at Seadrift Bayfront Park then joined the festivities at Seadrift’s Annual Shrimpfest. Under the pavilion Allan Berger, SABP Chair with Seadrift City Councilwoman, Peggy Gaines greeted the crowd, thanked all the partnering agencies who made the trail possible, and ceremoniously cut the ribbon to officially open the paddling trail. 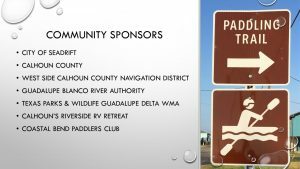 Paddling trail development takes effort and community support. It was through Allan Berger’s efforts that the Seadrift Paddling Trail became a reality. Allan, a Port O’Connor resident, proposed the trail, developed partnerships with community sponsors, gathered the agreements for launch sites and take out points, installed trail markers, delivered kiosks and arranged for their installation, and organized the inaugural paddle and ribbon cutting ceremony. Over a year’s worth of efforts for the benefit of the public to access and enjoy the wonder and beauty of the San Antonio Bay / Guadalupe Estuary System. Watch our exciting video of the inaugural paddle & official opening of the Seadrift Paddling Trail. It will be through your generous support that SABP can continue to provide remarkable contributions to our coastal community. 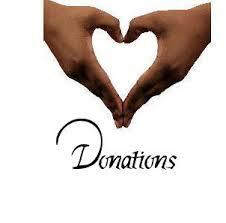 Make a donation today. Thank You!